Lissa: Every episode, I find myself saying, "So much to talk about!" The hallmark of a good show. Sani: Indeed! Last week, we outdid ourselves. ;-) This episode totally had me doing the "eyes bugging out and leaning forward in my seat" thing. I live tweeted during the whole thing and even my son came up to see the battle. Lissa: I'm glad my fears were unfounded that the earl or his men would hurt Floki to try to force him to reveal Ragnar's whereabouts. The acceptance of the challenge and the battle seemed to come so fast! I kept wanting to shout, "Hold on, I haven't prepared myself for this yet!" When Ragnar's sword broke, my reaction was the same as Lagertha's. I closed my eyes for a moment. But Haraldson had at least enough honor to not press his advantage unfairly when Ragnar threw the broken sword and his shield aside. Sandi: The earl's pre-fight commentary was VERY interesting to me. He seemed, there at the final night of his life, to pay Ragnar some private respect. But not so anyone beyond Siggy could see it. This was a surprise to me and I wondered (briefly) if it was a foreshadowing of Haraldson's victory. Lissa: It was so sad to see his insecurities out in the open, his fear that if he showed Ragnar respect or admitted he might have been wrong, his men would abandon him for Ragnar instead. He never did truly understand leadership, it seems. The use of the axes was very well done. It was the most common weapon in hand to hand combat and every one of the warriors had at least one when they fought. They wielded them well, the pair of them. Lissa: My favorite axe fighting scene remains the one where Ragnar runs home to the village after the attack. He's choppin' as he goes, with incredible skill and this sort of "I ain't got time for you, so die quickly, please," impatience. Sandi: We didn't even mention the raid last time. How careless of us. But yeah, I am with you. Lissa: Siggy really does seem to have loved Haraldson after all. Giving him those two precious locks of hair, her last tangible connection to her sons, when he lost his faith, and then her terrible cry when the jarl's lifeblood began to soak into the soil. I felt compassion for her for the first time. Sandi: Now, I saw that differently. What I was thinking Ragnar might have done was to cut off the earl's right hand, to disable him from fighting in Valhalla. This kind of dismemberment would have been mean, but final. I thought Siggy was responding to that possibility. As it was, Ragnar but sped the earl on his way. Lissa: I didn't think of that, probably because it seems such an un-Ragnar thing to do. In the end, he did respect Haraldson, even if it did come down to a battle to the death between them. As suspected, it seems there was at least a plan by Haraldson's right-hand-man to slay Ragnar if the earl fell in battle. It was refreshing to see no one tried to obey his command to kill him, and I smirked a little when his own end came swiftly. And Siggy, grabbing a dagger to murder her daughter's new husband! I was surprised there were no repercussions from this actions. Thyri's husband was an earl himself (where were his men?) and she just killed him in cold blood in front of everyone. Sandi: I had just tweeted that I wished someone would take out Short Second when Rollo axed him. I totally fist-pumped. I was surprised at Siggy's taking out of the Swede, though. I know she hated that he was her daughter's husband, but killing an ally in front of witnesses was foolish. I wonder if there will be repercussions. Lissa: And so Ragnar took the fur-covered throne, accepting the pledges of his people. When Rollo came forward, his poor face still showing the signs of his torture, I thought he was sincere and I was happy. The two of them working together would make a mighty leadership team, but then when he asked Ragnar how the two of them would ever be equal again during the raids, my heart sank. Sandi: I caught the "as long as" conditional to his oath and laughed, but inside, I wondered. Because Rollo made this oath in front of all the men...how much will that matter. Lissa: Haraldson's funeral was a jolly affair, the first time we've seen the "stereotypical" Vikings, tearing into meat with their bare hands, sloppily toasting one another with their drinking horns, and literally rolling around in the mud. Sandi: And Athelstan, meandering through looking dazed or drunk or both. But his new attire was nice. Lissa: They all had nice threads immediately afterward, which means Lagertha must have helped herself to some of Siggy's clothes and used cloth from the store room to dress the rest of the family. Bjørn holds his liquor better than Athelstan! I feel a little sorry for Athelstan right now. His faith is still a major part of his life, but he's beginning to love these people, even if their customs shock him on occasion. Ragnar shocked me with his cruel teasing when Siggy asked to light the pyre, bringing the torch to her and then handing it off to another. It seemed pointlessdly mean and out of character for him. If he didn't want to give her the honor, it seems the Ragnar we know would have taken her aside and gently explained his reasons why instead of slighting her in front of the entire village. And why? Siggy and he had no personal quarrel. I chalked it up to his being ill from his wounds. The producers did a wonderful job with that. In many series, the hero would bounce back right after the pivotal battle, perhaps with a slight limp or something, but Ragnar was worse-off after his fight with Haraldson. His face was sheened with fever-sweat and his eyes looked bleary all through the funeral festivities. Sandi: I concur - he looked quite horrible and weak. And even later in the winter, when both pig and pregnant lady were "fattening" (ha! to that!) he was still obviously recovering. instead of just telling the end-of-the-world tales? The dates in the series are a little wonky, since Ragnar's life is generally dated to between the mid 800s to 865, but in the range of dates, there was increased volcanic activity and some of the winters during Ragnar's lifetime are recorded as being especially harsh. Sandi: The Seer predicts events for the story, I think, as opposed to folks around the fire telling the old tales. I think we should consider a sea-scare a possibility. Lissa: The slave girl who elected to follow Haraldson to the afterworld really touched me for some reason. Perhaps it was a testament to the skill of the actress. I could feel her fear and sorrow to leave life, and the raw courage it took to follow through on her offer without wavering. I understood Bjørn s outrage when Athelstan wanted to leave instead of watching to honor her bravery and sacrifice. Sandi: I had to sit with Athelstan on this one. I wouldn't have wanted to see it happen. Bjørn, though, is very Old School and keen on tradition. I wonder if he is more like his mother or father in this regard? Lissa: And then, ah... my heart was broken when Rollo spoke of himself being the earl. I so hope he was just saying that so Siggy would be interested in marrying him, but I fear not. Sandi: Why didn't he go for Thyri??? I was baffled. Lissa: As alliances go, Thyri would have been the better choice, but I think Rollo has a bit of a thing for Siggy. She's also ruthless enough to help him in his plans, whatever they may be. Sandi: I have theories as to how Rollo might make himself earl and marry Siggy without killing off his brother. Exactly. Theories... At this point, I'll keep them quiet, though. I see Rollo as respecting Ragnar, but wishing to be his equal, not his supplanter. He wants his brother - and all the family, I think - out of the way. It appears they are sticking to the saga, as horrifying as that may be. 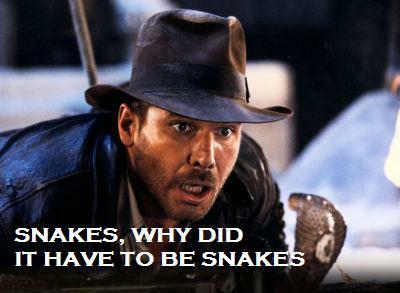 Sandi: First thing out of my mouth was the Indiana Jones quote. Lissa: And speaking of fear, the snake pit! God, what an awful way to go. Lissa: Let's hope they don't include Thora and Asluag! Love reading your "Viking" discussions each week. I wish you guys had done that during "The Tudors." It would have been nice to have someone point out all of the errors. I wonder why the film community feels like they have to distort history; didn't Henry VIII live an interesting enough life without having to embellish it? Have either of you watched "The Borgias?" I watched the first season but couldn't take their retelling of history. Looking forward to your discussion next week. I couldn't, with "The Tudors." The show made me ragey. I only made it through three episodes before I quit for good. It was like a bad fanfic version of Henry's reign, written by someone who dimly remembered seventh grade history. I, too, watched the first season of "The Borgias." I gritted my teeth in places, but it didn't bother me as much as "The Tudors." Which is understandable because I'm not as deeply enthralled by Italian history as I am with Tudor history. Who was the character or the actor's name with the wonderful speech about avenging his old age? He begged Ragnar to take him on the raids. "I am old but I have been a warrior all my life... I am forsaken, bereft, which is why I beg you, Lord, gift me the chance to die with honor in battle and join my friends in Valhalla." I'm not really sure. The site which has the subtitles of each episode lists his name as Tostig, but I can't find a character by that name listed on IMDB.